Why Lam Vien Restaurant is special ? The Garden restaurant 'Lam Vien' opened their doors after some years and the result is a nice garden restaurant, with an old tribal house for inside dinners... The garden looks great and is enclosed to ensure your privacy. The whole place has been transformed into quite a luxurious dining with the chef of Intercontinental Ho Chi Minh managing the kitchen. The menu is a nice mix between the western, Vietnamese/Asian kitchen. 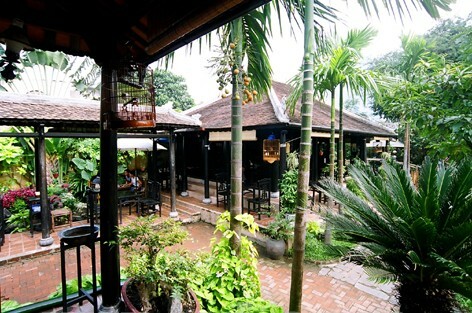 Attached to the restaurant the garden offers a small bar to enjoy a drink, relax or have a good conversation. In the Back of the Garden Lam Vien can arrange group BBQ's on request. Overall the place looks great, somewhat romantic, quiet and ideal for a business meeting. The Kitchen is professional with a keen eye for detail and friendly staff. How to get to Lam Vien Restaurant? 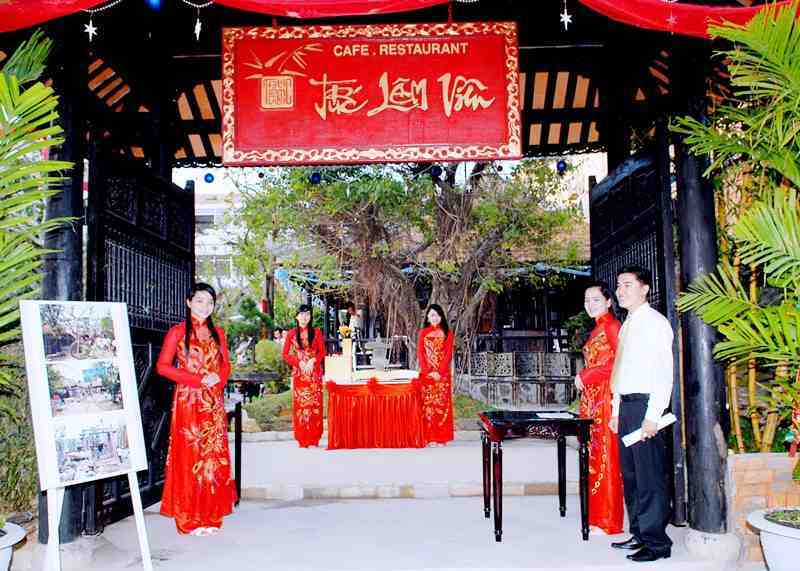 Lam Vien restaurant is situated on the beach road from Hoi An to Da Nang. Keep eyes on your kids so that they will not annoy others. You can get there by taxi. It takes about 15 mins from the city center. The waitress can speak good English. Lam Vien is rated #1 restaurant in Da Nang. Does it really deserve that top rating? I'll never know. The only way to conclusively determine that would be to go to the other 160 restaurants rated by TA, plus 600 or more that TA hasn't listed yet. Why do that, when you could just keep going back to Lam Vien?The best dinner I've had in Vietnam (a country justly known for an outstanding cuisine), and the most charming restaurant I've been to here. You can dine in a large and attractive garden (they have a small outdoor bar in the garden as well) or inside their elegant restaurant, where the mood was enhanced by tasteful French lounge music.The spring rolls Lam Vien were excellent: triangular, deep-fried, and accompanied by lettuce, fresh mints, and a mild sweet-hot sauce. The deep-fried chicken wings in black pepper sauce are addictive.Service was excellent; every staffer I met spoke English. The menu has English translations of everything, and photographs of many of the dishes. Dinner including beverage and a small 5% service charge they add to the bill, was about US$15. While you can certainly dine well in Da Nang for less than that, I'm not sure you can dine this well anywhere else in town regardless of cost.I'll attach photos of both dishes, and shots of the premises. Delicious, authentic Vietnamese food... the staff were lovely and the ambiance sitting outside was great! We had the trio of roll appetiizer, griled chili pepper squid which was brilliant and red fish w/ galangan and shrimp paste (plus a side of grilled augergiene w/ spring onions).Highly recommended! Lam Vien is rated #1 restaurant in Da Nang. Does it really deserve that top rating? I'll never know. The only way to conclusively determine that would be to go to the other 160 restaurants rated by TA, plus 600 or more that TA hasn't listed yet. Why do that, when you could just keep going back to Lam Vien? The best dinner I've had in Vietnam (a country justly known for an outstanding cuisine), and the most charming restaurant I've been to here. You can dine in a large and attractive garden (they have a small outdoor bar in the garden as well) or inside their elegant restaurant, where the mood was enhanced by tasteful French lounge music. The spring rolls Lam Vien were excellent: triangular, deep-fried, and accompanied by lettuce, fresh mints, and a mild sweet-hot sauce. The deep-fried chicken wings in black pepper sauce are addictive. Service was excellent; every staffer I met spoke English. The menu has English translations of everything, and photographs of many of the dishes. Dinner including beverage and a small 5% service charge they add to the bill, was about US$15. While you can certainly dine well in Da Nang for less than that, I'm not sure you can dine this well anywhere else in town regardless of cost. I'll attach photos of both dishes, and shots of the premises.